A leisure centre nominated for a national award has been praised after a visit from a Welsh Government minister. 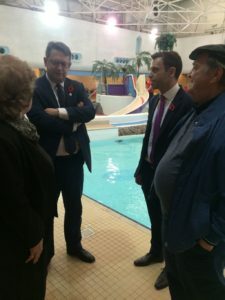 Alun Davies AM, Cabinet Secretary for Local Government and Public Services, was given a tour of Plas Madoc Leisure Centre on Thursday (November 8). Stella Matthews, chair of the Splash Community Trust, which runs the centre said: “It was wonderful to welcome the Cabinet Secretary to Plas Madoc and we’re very grateful to him for taking the time to visit and for his interest. Mrs Matthews will represent Plas Madoc Leisure Centre at the UK Social Enterprise Awards in London on November 28 after being named Social Enterprise of the Year Wales last month. Local AM Ken Skates was a founder member of the volunteer trust set up to save Plas Madoc after Wrexham Council voted to close it down in 2013.